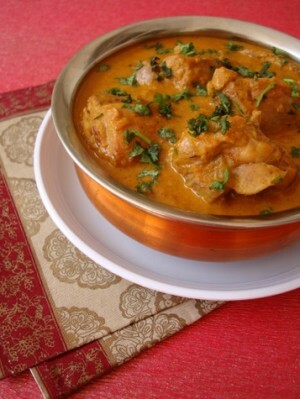 Chicken With Curd recipe by Mrs Durrani at DesiRecipes.com. Boil in water for few min till it become tender now remove the skin and blend it. Heat oil and put chicken and garlic and cook for some time. When the chicken has become golden brown just take it out. Now put some more oil and put yougurt ad cook till it becomes a gravy. Now put taiz patta and cinnomon stick in it till gives aroma. Now put ginger , haldi , salt , kutte mirc and and tomato puree and let it cook for some time till the oil separates. Now add chicken to it and put haree mirch and put 1 cup of water and cook for some time till the chicken is tender and lower the flame. Now garnish with coriander and serve with naan or rice.